You may receive updates from Fund Our Future, the sponsor of this form. 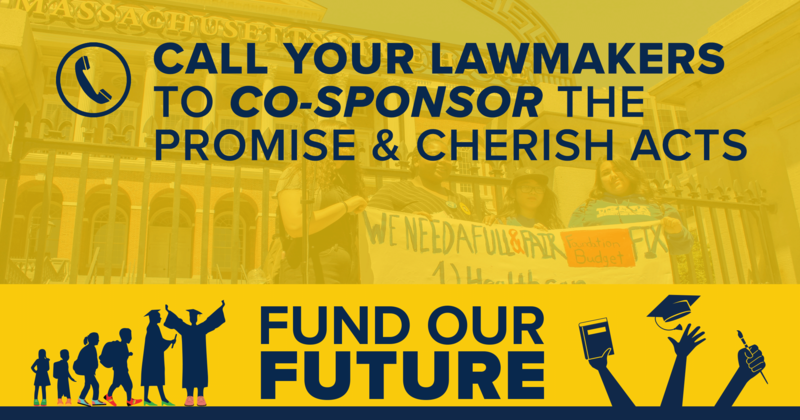 Call Your Lawmakers to Co-Sponsor the Fund Our Future Bills! UPDATE -- January 30th at 5PM: We have 73 lawmakers signed on to the Fund Our Future Promise Act for public schools and 40 lawmakers signed on to the Cherish Act for public colleges. We need as many co-sponsors as possible to create pressure for urgent action! The tool to find your lawmakers' phone numbers and a call-in script are at the bottom of this page! We’ve launched the Fund Our Future campaign by filing the Promise Act (SD 101/HD 434) to fund K-12 public schools and the Cherish Act (SD 740/HD 1178) to fund public higher education. We need your help to send the Legislature a message. Please call and email your State Rep and State Senator and ask them to co-sponsor the Fund Our Future bills. Use this tool to make a call, and click here to send an email letter now! We need you to pick up the phone and call your representative to demand that all of our students deserve a fair and equitable investment in their futures! Hi my name is [INSERT NAME] and I am calling to ask Representative/Senator [INSERT REPRESENTATIVE/SENATOR'S NAME] to co-sponsor the Fund Our Future bills to provide fair, equitable and just funding Massachusetts public schools and colleges. The Promise Act (SD 101/HD 434) and the Cherish Act (SD 740/HD 1178) will provide desperately needed funds to public education in Massachusetts. It is critical that the House and Senate pass these important pieces of legislation. My district school/college campus [INSERT DISTRICT SCHOOL/COLLEGE CAMPUS] is in dire need of fair and equitable funding in order to build the future our community and students deserve. I hope Representative/Senator [INSERT NAME] will co-sponsor these bills and ensure the House and Senate pass the Promise Act and the Cherish Act this spring!